Juma Mosque is located on the terrytory of the ancient architectural complex Ichan-Kala. It differs from other mosques of Khiva. There are no entrance arches, portals, and even traditional domed ceilings. It is one-storey building with a massive wall and three entrances. Not far from the mosque you can also see attraction such as: Muhammad Rahim Khan II Madrassah, Pahlavan Mahmud Mausoleum, Mukhtar Ata Sheikh Mosque. Juma Mosque was built in X century. It was the largest building in the city at the time of construction. In the second half of the XVIII century the mosque was rebuilt by Abdurrahman Khan Mehtar, the ruler of Khorezm. According to scientists, the architecture of some columns was borrowed from more ancient buildings. Wooden elements of the mosque are of particular interest, made from hand-carved by the best masters of the Khanate. The main room of the mosque is a large hall, where Friday prayers are held. Juma Mosque is the general name of so called “Friday” mosques in the Muslim East. 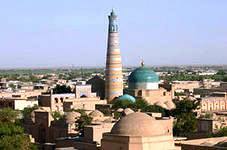 This magnificent structure occupies the most important place among all other mosques of Khiva.